Wadih Duailibi’s family. 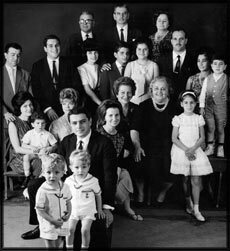 His wife Cecília (center) and sister Inês, surrounded by children, grandchildren, sons and daughters in-law..
Family D is relatively small in comparison with other families. Although we have spread throughout the Middle East, Europe, the Americas and Australia, we are but few. Depending on the country to which the family moved, the D name took on numerous different spellings: Duailibi, Dualibi, Dualibe, Duailib, Dawalib, Doualib, Dwaleebee, etc. We have counted 12 different spellings so far. However, no matter how you write our name, all D’s share the same origin. It is likely that all D’s knew each other personally a mere two or three generations ago. As the families grew over the years, two D’s may perhaps have met without knowing anything about the origin of their parents and grandparents or how they themselves are related. Nevertheless, their great-grandparents probably grew up close to one another, were born in the same house and lived in the same community. Before the distance between families expands and members become unaware of each other, some years ago we took the initiative to develop a very comprehensive study of all the existing D’s around the world. This task has become feasible thanks to the collaboration many have kindly granted us. Firstly we wanted to publish a book. Now, we have this website, where the present researches on Lebanon and the Lebanese migration in Brazil and information on the family. The genealogic tree is constantly updated and stories and pictures are frequently posted. We think that a website allows us to have the latest news on the family; therefore, we update it permanently. We also newsletters that you can freely download at Family D menu. You may be asking yourself about the purpose of a study like ours. We believe that in an evermore globalized world the preservation of the history and legacy of our ancestors will help strengthen the ties among the present and future generations of Family D members. Our children and grandchildren will know the story of their forbearers and our family history will endure time. We also think that it is important for new generations to know the history of the place where they came from, in addition to knowing who their ancestors were. Therefore, we bring different information on Lebanon so not only the family, but also researchers and people interested on the subject can learn more about the Lebanese history and culture, which has a very strong presence in Brazil. In our website, we gather information on the collection maintained for over 40 years by Sylvia and Roberto Duailibi. Welcome and enjoy your reading!